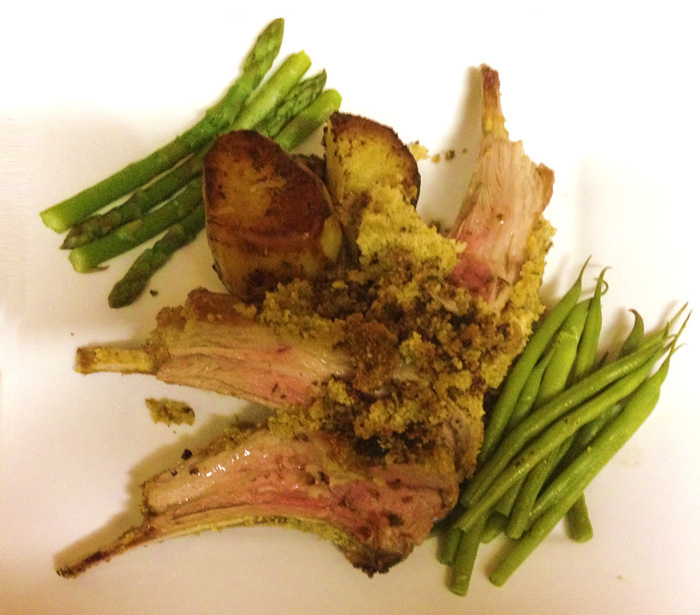 Kelly has put together this easy to follow step by step guide to a delicious herb crusted rack of lamb with fondant potatoes, perfect for those fast approaching winter nights. 1. Heat oven to 200C/180C fan/gas 6. Tip the breadcrumbs, herbs, zest and Parmesan into a food processor with 1 tbsp of the oil and some seasoning. Blitz until everything is finely chopped. 2. Heat the remaining oil in an ovenproof frying pan. Season the lamb, then brown it well on all sides and turn off the heat. Turn the racks so that they are fat-side up, and brush liberally with the mustard (Step 1, above). Pack over the herb crust (Step 2), drizzle with a bit more oil, and roast for 25 mins until the crust is golden and the lamb is cooked – this will produce lamb that is pink in the middle but cooked all the way through. If you like your lamb rarer, roast for only 20 mins; if you like it more done, give it 5 mins more. Put the lamb on a board to rest. 1. Heat oven to 190C/170C fan/gas 5. Peel the potatoes and pat dry with kitchen paper. Heat the oil and butter in a flameproof dish, add the potatoes and brown all over – this will take about 5 mins. Season well, add the thyme sprigs and stock, and bring to the boil. 2. Transfer the dish to the oven, uncovered, and cook for 25-30 mins until the potatoes are tender.